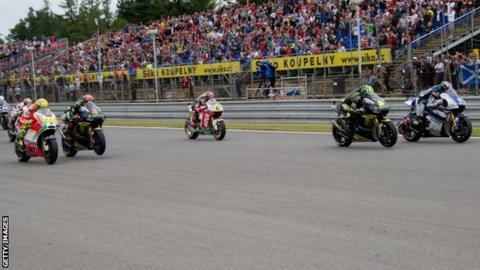 A new race in Texas has been confirmed on the MotoGP calendar for the weekend of 19-21 April 2013. The race will take place at the Circuit of the Americas in Austin, Texas, which will host a Formula 1 race next month. Carmelo Ezpeleta, head of organisers Dorna, said: "We are excited to bring our series to an exceptional new facility in Texas." The announcement leaves just another proposed new race in Argentina in April still to be confirmed. The Texas race will be the third of the season, which starts with the now traditional night race in Qatar on 31 March. Building work on the new Texas circuit was halted in November 2011, when the circuit's owners said they had not been granted a contract to stage the race. But the track was last month and the F1 race will take place on 18 November.